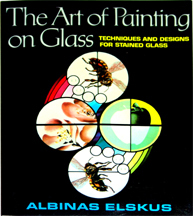 Chapter 1: What are Vitreous Paints? Chapter 2: Mixing Glass Stainer’s Colors. Chapter 3: Choosing and Using Basic Equipment. Chapter 4: Some Thoughts on Painting Techniques. Chapter 5: Tracing: The Linear Dimension. Chapter 6: Matting: The Tonal Dimension. Chapter 7: Staining, Emameling, and Etching. Chapter 8: Firing Painted Glass. Chapter 9: Using Traditional Techniques Creatively. Chapter 10: Basic Design Considerations. Copyright © 2006-2016 Steve J. Noll All rights reserved.